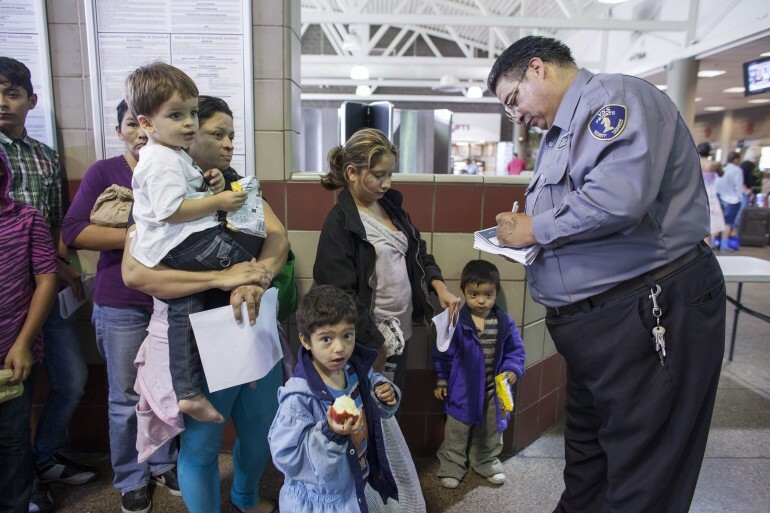 More of the 1,700 immigrant mothers and children petitioning asylum courts could be released from family detention centers following an initial court ruling against DHS last Friday . The ruling is already having an effect, increasing the chances of immigrants making bond, according to Elise Foley of the Huffington Post. Critics have hounded the Obama administration since it decided to reinstituted the practice of detaining children and their mothers last year following an influx of migrants from Central America. DHS oversees Immigration and Customs Enforcement (ICE), which runs the family detention centers. As the ruling stands, ICE facilities must abandon blanket detentions and release immigrant children and guardians who don’t pose a flight risk. The decision is not immediate; the government has 90 days to convince the judge otherwise. Lawyers for plaintiffs in the case (known as Flores ) welcomed the ruling. Karen Lucas, Associate Director of Advocacy for the American Immigration Lawyers Association, called on DHS to embrace the ruling. “Judge Gee clearly states that the  Flores settlement agreement prohibits the government from holding immigrant children in secure facilities or in facilities that are not licensed for the care of children, yet that is what DHS continues to do instead of releasing children with their mothers wherever possible as the agreement requires,” Lucas said in an email to the Latin Times. Lucas’ organization was part of a coalition of immigrants’ rights groups that brought a suit against DHS, highlighting poor conditions in the ICE facilities. Immigration advocates have argued for months that the conditions are unacceptable, especially for children. Here are just a few of the complaints listed in the case. 250 kids were given adult doses of of the Hepatitis A vaccine; others were give redundant vaccines without their parent’s consent. In some cases, children were inappropriately separated from their parents and left with guards. In other cases, children were forced to stay with their parents inappropriately, such as in the case of a woman confined to solitary confinement after a suicide attempt. “[Recent cases] of deplorable medical care [...] are just the latest example of how inhumane and traumatic the incarceration of families has proven to be [....] Family detention must end and it is shameful that the federal government continues on this path,” Lucas said. Many immigrants being held in family detention did not enter the country illegally and are not flight risks. The government admitted as much when making its “deterrent” argument. By law, asylum seekers are allowed to present themselves at the border and declare their intention to apply for asylum. Detaining such immigrants is against international agreements, according to Alice Edwards, a senior legal coordinator for UNHCR, the worldwide refugee agency. "It is not a crime to seek asylum. Detention must therefore be a last resort, and its necessity and proportionality must be assessed on an individual basis,” Edwards said in a June 2011 statement . “The failure of many governments to provide for or systematize alternatives to detention can put their detention policies and practices into direct conflict with international law." Many detained immigrants subsidize the prisons that house them by working for less than $4 per day, according to a recent story by Molly Hennessy-Fiske for the L.A. Times. Hennessy-Fiske’s article identifies how immigrant workers in prisons are coerced into working, denied worker protections and likely essential to private prison companies’ profits. As Obama’s As Secretary of State, Hillary Clinton defended the administration’s decision to detain and deport families in immigration jails last fall, saying that America needed to send a “clear message” to would-be migrants in Central America. As a presidential candidate, she has criticized the specifics of the practice. “I do not think we should put children and vulnerable people into the facility because they think they are at risk, their physical and mental health are at risk,” she said to a group of Dream activists in Nevada in May. Former Maryland Gov. and rival Democratic candidate Martin O’Malley opposes family detention as well. He called for the Obama administration to acquiesce to Judge Gee’s ruling and abandon family detention all together, calling them “internment camps” -- a term that evokes the imprisonment of Japanese-Americans during World War II. "Detaining refugee mothers and their children in internment camps is contrary to everything for which our country is supposed to stand. I urge the Administration to agree to the judge's request to place all refugee mothers and their children into the homes of their relatives or into foster care,” O’Malley said in a statement on Sunday.